In this issue of PieceWork, encounter needlework from seventeenth-century elaborate raised embroidery, motifs on a christening robe, charted images used in filet crochet, and the ubiquitous knitted eight-pointed star/flower/snowflake motif, plus traditional projects to knit, stitch, and crochet. PieceWork March/April 2013 Has Arrived! Until the invention by Johannes Gutenberg of automated movable type in A.D. 1452, the number of people worldwide who could read remained very small, the vast majority of them wealthy members of society or clergy. To communicate with nonreaders, pictures were used. 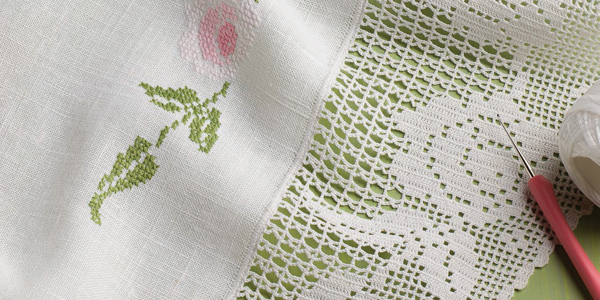 These might be painted on canvas (the word “picture” comes from the Latin word pictus (“painted”), or, as you’ll see in this March/April 2013 issue of PieceWork, executed in needlework. From among the countless possibilities, we’ve selected examples from seventeenth-century elaborate raised embroidery, motifs on a christening robe, some of the charted images used in filet, and the ubiquitous knitted eight-pointed star/flower/snowflake motif. Projects include a sweet knitted cardigan for baby, a stumpwork dragon, and the knitted pincushion that received the grand-prize in PieceWork’s 2012 Pincushion Contest. “Alone among crochet styles, filet crochet accommodates pictorial designs and text, and its patterns were the first crochet patterns to be worked from a chart.” Learn more about the technique of filet crochet and try your hand at it with instructions for square (or filet) crochet from The Ladies’ Complete Guide to Crochet from 1854. Learn the story of Rechs Ann Pedersen and the Nordic-style cardigan knitted by Rechs’ mother in the 1940s. Plus, create your own Nordic-inspired cardigan with the Dancing Couple Cardigan to Knit for Baby pattern. “Raised embroidery (later known as Stumpwork) reached its height of popularity between 1650 and 1690. Mastering the technique was the culmination of a wealthy young girl’s needlework education, attempted only after she had completed a band sampler that served as a record of patterns and techniques and after that, a technically more difficult whitework sampler.” Start your own needlework sampler with A Stumpwork Dragon to Make. Travel back to the Victorian Era (1837–1901), when scientific and industrial growth contrasted with the strict rules of social behavior for men and women. Learn about the increased interested of both men and women in horticulture and botany, and see how this influenced home decoration and needlework. Explore the eight-pointed motif common to Norwegian knitting, and see its application in different patterns as a snowflake, star, and flower. Add this motif to your own collection with A Snowflake/Rose Ski Headband to Knit. Learn the turbulent history of the Burgh of Arbroath and the infamous reef off the coast that caused many shipwrecks, leading to the creating of Arborath’s lifeboat station. See the delicate interpretation of this lifeboat motif that graces the Arbroath Robe. Plus, create your own family heirloom with A baby Bonnet to Embroidery in Whitework. This design was the grand-prize winner in PieceWork’s Excellence in Needle Arts Awards: 2012 Pincushion Contest. June Hariprashad graciously knitted this second sample for photography while the original was on display. Knit your own To Everything There Is a Season pincushion with complete written instructions from the designer. “It is slow work, impossible to rush, so time-consuming that some pieces have required years to complete. Extreme expertise, patience, and discipline are mandatory. Executed with historically correct precious materials, it can be prohibitively expensive. Or nué (shaded gold) is spectacular and perhaps the most breathtaking embroidery form of all time.” Learn about this fine embroidery technique, and create your own stunning embroidered piece with An Or Nué Heart to Embroider. Join Anne Berk in a brief exploration of pictorial knitting techniques, plus get tips and techniques for working multiple colors of yarn at once, including best uses for intarsia, stranded knitting, and duplicate stitch. Motifs, symbols, drawings, secret messages—all are included in this March/April 2013 issue. The adage “One picture is worth a thousand words” continues to ring true. Enjoy!